Technological advances over the last few years have led to the development of much more efficient ways of doing business. Back in the late 1990s, one way that companies sought to address customers’ changing expectations was by incorporating eSignatures into their business transactions. 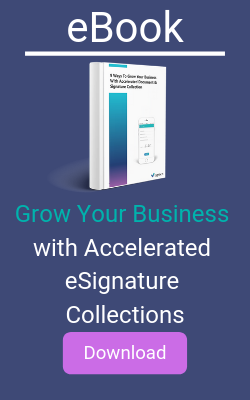 Today, many organizations use eSignature software to record legal signatures and lock in documents likes sales contracts or employment paperwork that an employee, partner or client needs to provide. And companies have reaped the benefits. The number of worldwide eSignature transactions jumped from 89 million in 2012 to 754 million in 2017. But what worked back in 2000, when a U.S. Federal law known as the Electronic Signatures in Global and International Commerce Act was passed, fails to address the enormous customer service gap that has emerged over the last decade, particularly with regards to serving customers on their mobile phones. Beyond basic digital signatures and integrations, what has your eSignature done for you lately? A seismic shift is taking place and the electronic signature your organization is using could be causing your conversion rates to plummet. The reason is that within the last couple of years, mobile web usage compared to desktop has skyrocketed. Some stats to consider: The percentage of people visiting mobile devices grew from 57 % to 63%; the percent of time spent on mobile devices increased from 40% to 49%; and the mobile bounce rate dropped from 52% to 47%. Several studies point to a faster than expected shift from desktop to mobile usage. However, most first generation eSignature solutions require mobile users to access their email, and then present their documents in full Letter size or A4 presentation on small screens. So while they are in fact mobile accessible, they fail to deliver a mobile-optimized experience. This poor mobile experience is hurting application completion rates. Another trend that first generation-signatures aren’t accounting for is the development and proliferation of Integrated Customer Management Systems (ICMS). Amdocs coined this phrase way back in 2004. Driven by the concept that price and quality of service have become negligible differentiators for companies, customer experience emerged as the primary way service providers can stand apart from competitors. ICMS have been developed to align people, processes, and technology to enable service providers to deliver the customer experience they intend. With regards to eSignatures and other aspects of document collection, shifting from a system-driven to a customer-centric corporate culture means that such features as agent/customer co-browsing and the ability to collect docs and ID from anywhere are what today’s increasingly distracted and mobile customers have come to expect. So while first-generation eSignature solutions offer basic digital signatures, they are notoriously ineffective in delivering the complete experience businesses want to deliver and customers expect. In many instances, the documents businesses send to customers are not as clear as they might hope for. They often are misunderstood and cause the customer to hesitate or abandon their process. Customers oftentimes need some guidance and clarification that rudimentary digital signatures don’t account for. As a result, such signatures are typically sent and forgotten. Question: do your customers have the ability to review documents live and collaborate with an agent on answering any and all questions? New research points to an enormous CX gap. While customers have come to expect instantly-completed business interactions everywhere, even from their mobile phones, many businesses are unable to deliver. That’s because contact centers lack the solutions required to make their solutions agile enough to simplify complex processes for today’s increasingly distracted, mobile customers. Specifically, it’s the critical last mile of the customer journey that often requires customer consent, documentation, visualization, payments, signatures, submission of documents/ID and more. The mismatch between today’s on-the-go customers and desk-oriented technologies has made it nearly impossible to deliver the instant, mobile, compelling and memorable experiences that today’s customers demand with basic, dated eSignature solutions. Is it easy to use? If your clients are required to scan documents, they’re more likely to abandon the entire eSignature process. To boost completion rates, it’s crucial that your users’ experience be seamless, particularly for on the go customers, so that they can complete any task directly from their mobile phone in one shot. Is it flexible? You’ll want to use an eSignature that enables different solutions, like agent-assisted or self-serve options. For your agents, an eSignature solution should be easily incorporated into your organization’s wider processes and workflows, including contracting, form filling and collections. And if you manage to find an eSignature that integrates with your current CRM system, all the better. Is it in real time? To increase form completion rates, your eSignature should facilitate an open, real-time and secure customer-agent collaboration. For instant processing, it’s important to find a solution that’s compatible with your organization’s document generation and other systems. A next-generation eSignature that enables live collaborative document review and instantly completed signatures will enhance the customer experience while reducing the chance of abandonment due to customer frustration. Is it comprehensive? Ideally, your revamped eSignature will be able to facilitate the completion of the entire process, everything from ID/document collection to form-filling and payments. Ultimately, the goal of every agent/customer interaction is to close as quickly as possible, with electronic signatures being one component of this process. Since their introduction in the late 1990s, basic digital signatures have enabled parties to contract with one another remotely and digitally, but haven’t evolved much beyond that. Meanwhile, next-generation eSignatures that are part of a wider, customer-centric system are making it possible for agents to instantly collect documents, eSignatures, and payments while customers are on the phone. This use of next-generation eSignatures streamlines workflows, ticks up customer satisfaction and increases completion rates. In short, next-generation mobile ready eSignatures unlock enormous value from their customer interactions, removing friction that frustrates customers (FCR), hurts business (Sales) and weakens brand loyalty (NPS & CES).